Glass roofs come in many shapes and forms from a small flat rooflight on a typical home extension to a large roof glazing structure on a major shopping centre or train station. A rebated timber rafter is the most basic of methods where the glass is usually seated on a glazing tape and then a continuous wooden capping with mastic tapes clamps the glass in place and keeps the water out. This used to be a popular method in Victorian times and still sometimes see today even on high-end timber conservatories, but it is not a satisfactory method and leaks often occur due to movement in the timber. The external cappings require regular painting and maintenance if they are not to deteriorate quickly in our English climate and all round, is not considered a reliable method. Patent Glazing was first introduced at the turn of the 20th century and remains the most reliable and cost-effective method to form a glass roof. Examples can be seen on many trains stations and covered markets throughout the UK and are best used for unheated spaces where no thermal insulation is required. Typically, the glass is single glazing and supported on the long sides only with glazing bars spaced at nominal 600mm centres thus being quick and simple to install without any complicated handling or lifting equipment required. The glazing bars have integral drainage channels and generally, it is not recommended to install below 15° pitch for weather-tightness reasons. A wide range of thermally broken systems suitable for double or triple glazing are available varying from rather pedestrian PVC-U glazing bars for the domestic market through to more robust aluminium systems aimed primarily at the commercial sector. These systems have thermal breaks that reduce the transfer of heat between inside and outside of the building, thus increasing insulation and reducing the risk of condensation forming on glass roofs. These systems tend to be suitable for installation up to 800mm glazing bar centres, but rarely provide the non-fragility and/or air-tightness performance required to meet latest building regulations. There are many high performance aluminium systems available for glass roofs that vary from high end stainless steel, linking panel systems, though to sloped curtain walling systems and high performance sloped glazing systems designed specifically for the purpose. These systems lend themselves to be used at wide glazing bar centres, typically up to 1200mm wide and offer superior weather, air-tightness and non-fragile performance as the glass roof panels are retained on all four sides. Look for systems that have been independently tested and provide certification of performance in terms of air-tightness, weather-tightness, thermal performance and non-fragility. The ‘glass box’ is a fashionable addition to many homes and buildings proving very popular with designers at time of writing. These glass structures are usually silicone bonded at the joints and glass fins provide the support to the glass roof panels so the appearance is ‘frameless’ with little or no visible metal. Bolted glass is another method with Planar being a good example. A very bespoke solution and expensive to install, but without doubt a very smart contemporary appearance can be worth it. Only use a contractor with a proven track record and the management & technical expertise to successfully install such bespoke glazing. 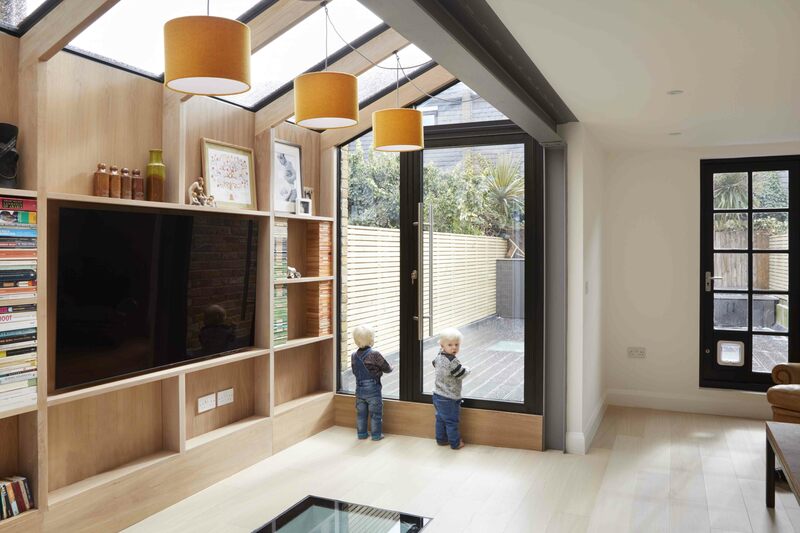 Modular flat rooflights are often used to provide additional light to flat roof home extensions featuring the ever popular bi-folding doors across the front. Many standard size rooflights are available from a plethora of manufacturers ranging in price and quality and it is never so true that you ‘get what you pay for’ so it is important to research and ensure you deal with a professional and reliable manufacturer. Single and multi-pane variations can be manufactured with non-fragile and walk-on glass to suit roof terrace or ground floor patios over basement rooms. Fixed and opening versions are available for both ventilation or access and can be manually or electrically or manually operated. Flat Rooflights offer a cost effective and easy method of providing daylight and small rooflights up to say 1000mm x 2000mm can usually be installed by any competent builder without the need of employing a specialist contractor.